If you’ve used fountain pens for any amount of time, you’ve probably heard of Tomoe River paper. If you haven’t heard of it before, it is widely regarded as one of the best and most fountain pen friendly papers around. People love it for many different reasons. One reason is that it is very thin, which means notebooks or letters that use Tomoe River paper are thinner and lighter. Another reason is that it shows an amazing amount of sheen. Both of these features come at a cost, though. Thin paper usually means more ghosting and high amounts of sheen usually mean longer drying times. Let’s take a closer look at this paper and see what makes it so special. For this post I’m going to review the Tomoe River 52gsm loose leaf paper. This is the same paper that is used in the Hobonichi Techo daily planner and a variety of notebooks. The first time you handle Tomoe River 52gsm paper (from now on in this post I’ll just refer to it as Tomoe River), you’ll be amazed at how thin it is. Grab a sheet and you’ll feel more like you’re holding tracing paper than writing paper. Once you start writing, all doubts will go away. This is definitely writing paper. 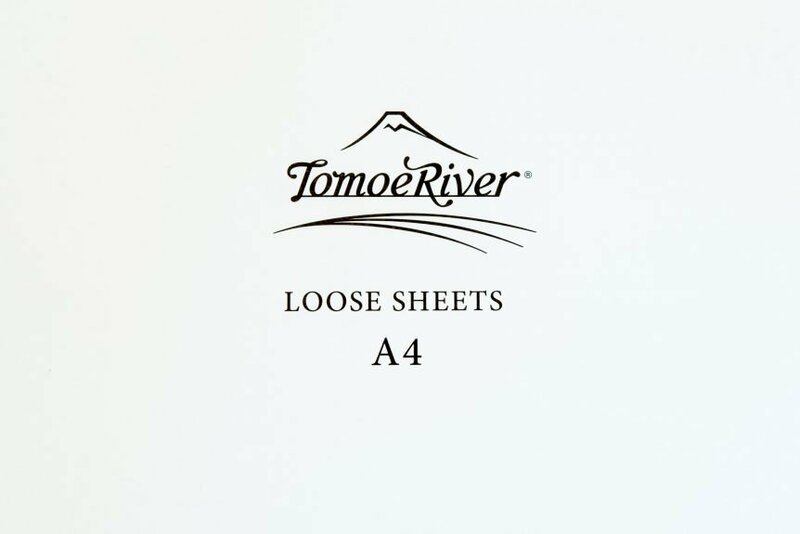 Many different vendors have started selling Tomoe River paper products. Some offer packs of A4 or A5 loose leaf. Some bind it into journals. Some print their own grids or dots. The info below is for what you will typically see offered, but if you want something else you can probably find it if you look hard enough. As I mentioned, the first time you use Tomoe River paper you’ll probably be skeptical until you actually write on it. Once you do, you’ll know it’s the real deal. Fountain pens glide across its surface. It has a very smooth feel, but not quite as smooth as a paper like Clairefontaine. One unfortunate aspect to the thinner 52gsm version of Tomoe River is that it is easier to wrinkle or crease, so if you write with a heavy hand it might frustrate you a bit. If you write in a notebook the pressure from your pen will also probably leave impressions on the pages behind it, so a writing guide is highly recommended. Fortunately, you don’t need to worry about the paper tearing or your pen poking through to the other side. Despite how it feels, it is tough paper. Tomoe River is extremely fountain pen friendly. Inks do not tend to bleed or feather. I also believe that it gives my writing a more bold, crisp look as well. Another drawback to the thinness of the paper is the amount of ghosting it has. 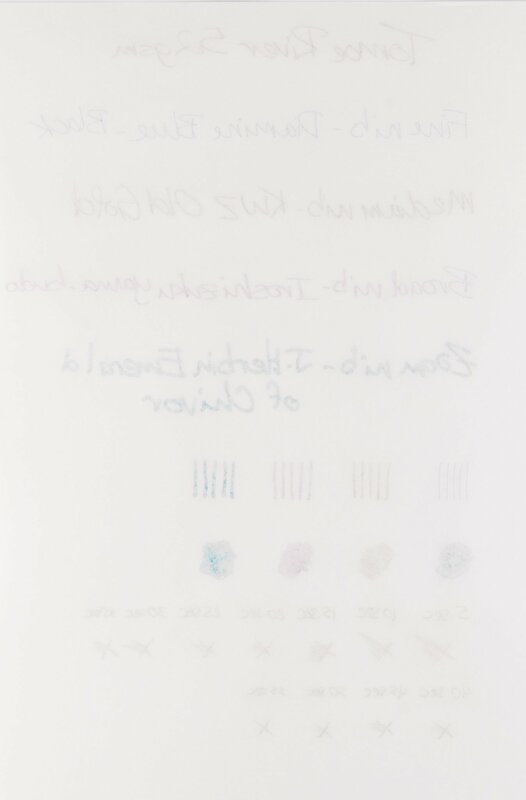 When writing letters, I don’t use the back of each sheet because of how much you can see the writing on the other side. In my Hobonichi Techo planner where I have to use both sides of a page, it’s easy to see the writing on the other side, but it doesn’t interfere with the readability. I just don’t personally think it looks very nice. 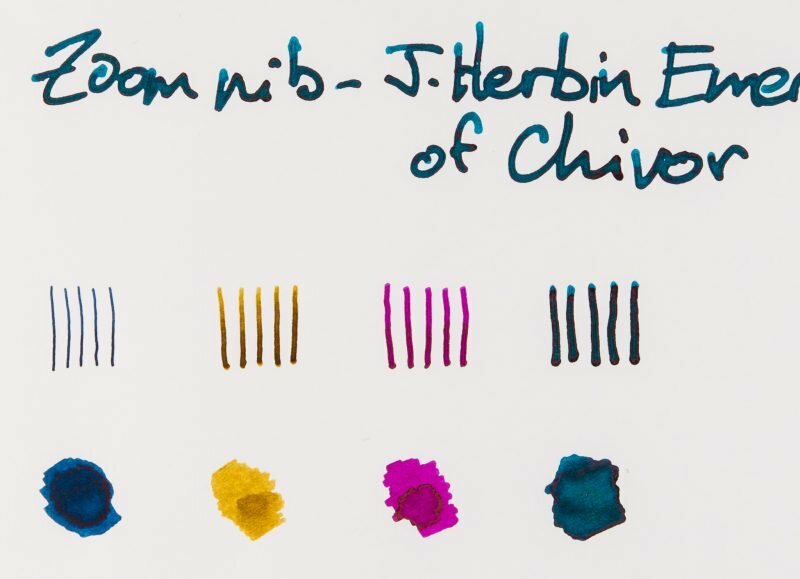 One of the main reasons everyone likes Tomoe River is the amount of ink sheen that it shows. 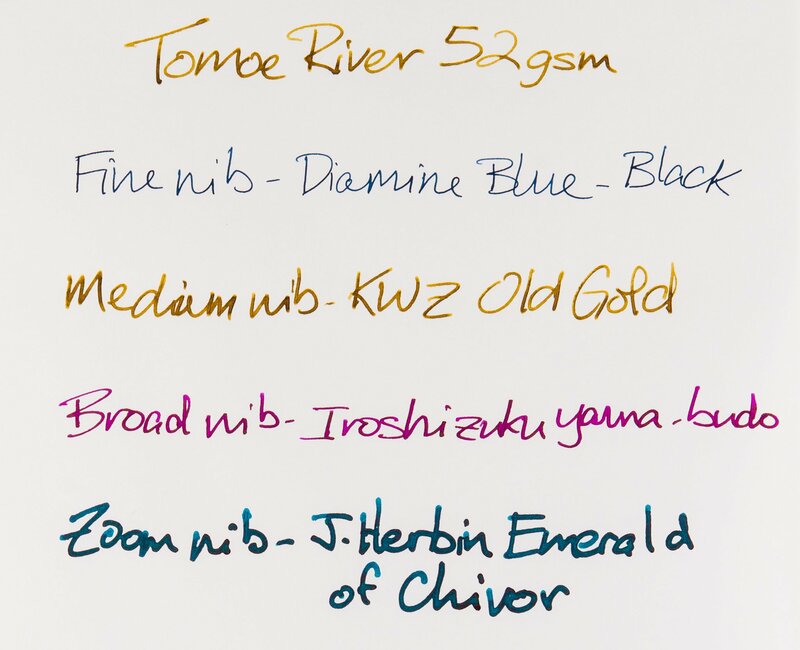 If you have an ink that sheens, Tomoe River will show it off better than pretty much any other paper around. You can see for yourself in this post where I compare sheen on different papers. If an ink doesn’t show sheen on Tomoe River, it doesn’t have any. It also has decent ink shading, although I’d only call it average compared to many other papers that are on the market today. 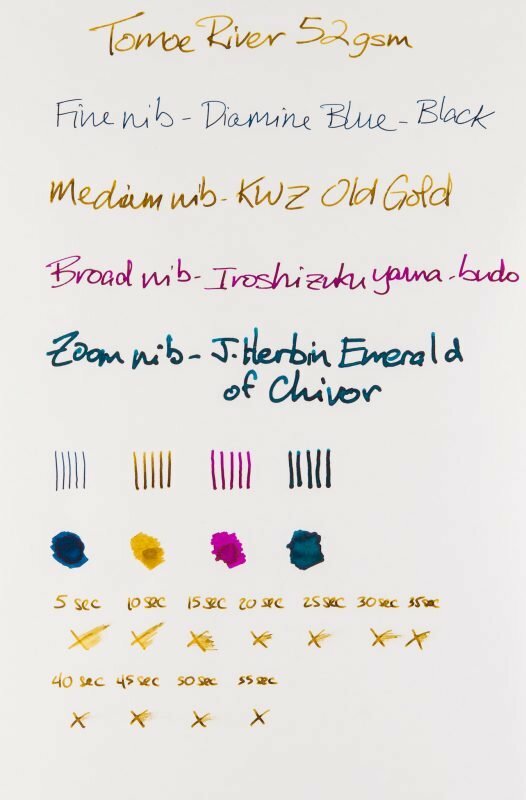 Here is a detailed look at the writing samples using various nib sizes. Here is a detailed look at the front of the page. Here is a detailed look at the back of the page. One of the biggest drawbacks to Tomoe River is how long it takes ink to dry. Depending on which ink you’re using and how wet of a nib you have, normal writing could take over a minute before it is dry to the touch. This means that if you’re left-handed you’ll have to be extra careful. Even if you’re right-handed you’ll likely smear a few words the first few times you write on this paper. Another drawback to Tomoe River paper has to do with how much sheen it shows. 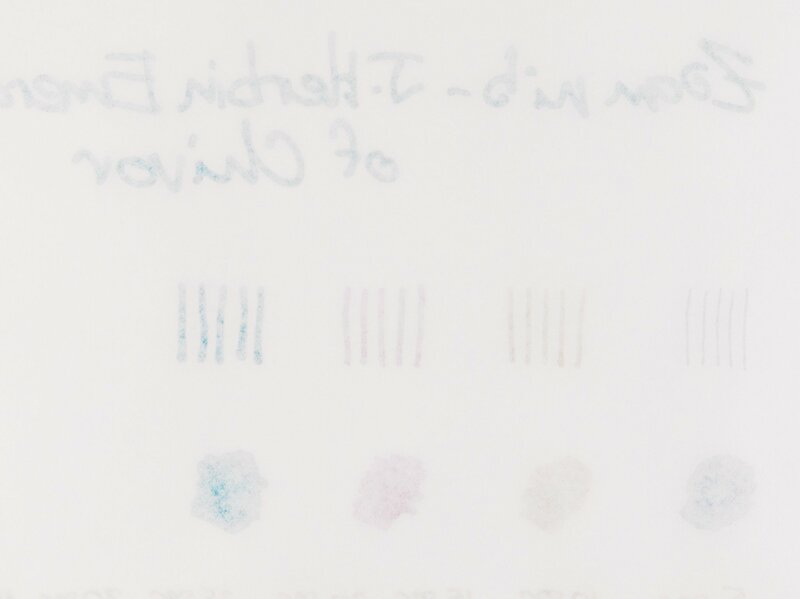 Many high-sheening inks leave a layer of dye on the surface of the paper. This can smear hours or even days after the ink has dried, which is always a nasty surprise. Other papers that don’t show as much sheen don’t typically have this problem. Granted, it won’t happen with every ink that you use, but it does happen, so beware. In my mind I equate Tomoe River paper to a sports car. It’s not exactly easy to use and isn’t always practical, but is it ever fun! There are many different outstanding papers on the market that are easier to use and are still fountain pen friendly, but they’re just not Tomoe River. I’ve tried almost every type of paper around and still haven’t found anything that is quite like it. Does that make it the best? No way. Other papers offer a comparable amount of sheen, better drying times, better shading and less ghosting. Still, writing on them just doesn’t feel like Tomoe River. Another aspect that I haven’t mentioned yet but need to is the cost. Tomoe River is not cheap paper. This is reflected both in the price of loose paper and in notebooks that use it. It isn’t the most expensive paper on the market, but it is definitely not cheap. If you’re willing to buy larger A4 sheets and cut them down to A5 size, the cost is reasonable, but most notebooks that have Tomoe River paper in them are significantly more expensive than a similar notebook with different paper. As I said at the beginning of this review, people use Tomoe River for a few main reasons… the amount of sheen that it shows and how thin and lightweight it is. 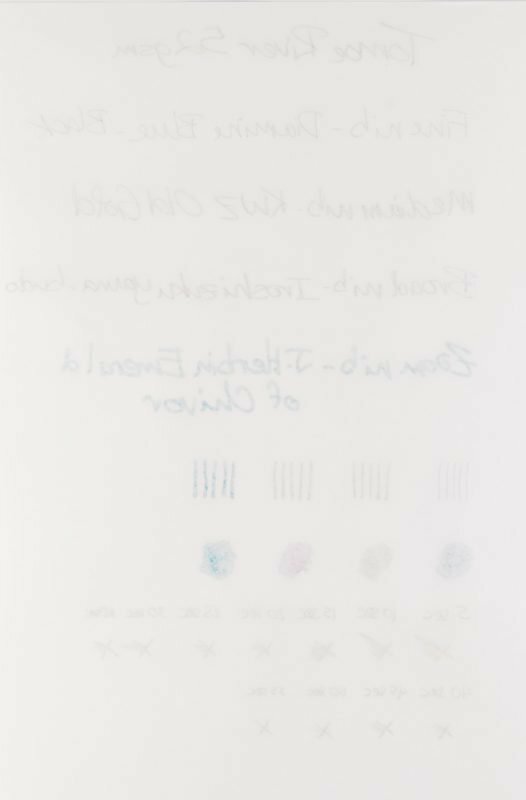 It also happens to be very fountain pen friendly and rarely bleeds or feathers, although ghosting can be an issue if you like to write on both sides of a sheet. If you’ve never tried it out before, I would highly suggest you pick up a pack of Tomoe River 52gsm loose leaf paper or find a notebook that’s made with it. If you think the thinness of the paper is really going to bother you, you can also get the thicker 68gsm paper in notebooks or loose leaf. It has the same characteristics but the paper is thicker. Expect a complete review of it in the near future. 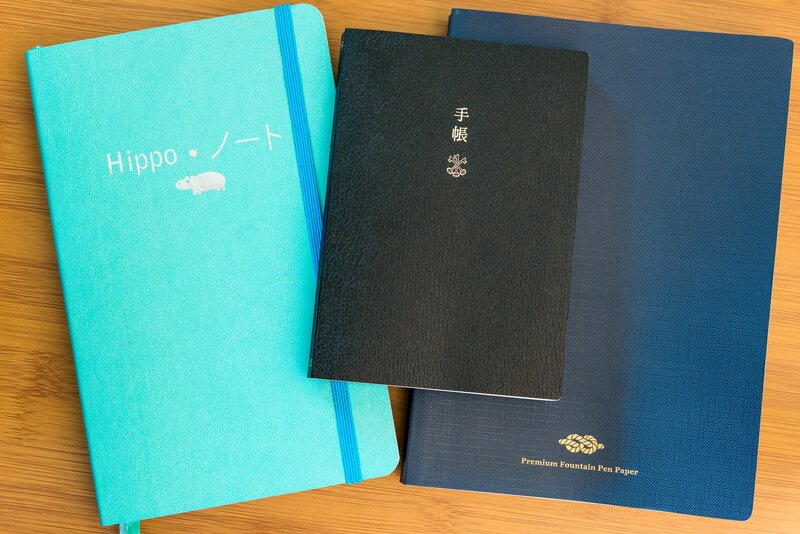 Some notebooks and planners come with Tomoe River paper, either the 52gsm or 68gsm variety. Interested in trying this paper before buying a whole pack of it? Head over to my shop and pick up a paper sample pack.